I have to problems left on my dev machine. 1. The Security Token Service is unavailable 2. Get the user profile sync serve started. I have tried to directly browse to http://localhost:32843/SecurityTokenServiceApplication/securitytoken.svc but Chrome keeps on displaying "the page cannot be displayed"
The server was unable to process the request due to an internal error. For more information about the error, either turn on IncludeExceptionDetailInFaults (either from ServiceBehaviorAttribute or from the configuration behavior) on the server in order to send the exception information back to the client, or turn on tracing as per the Microsoft .NET Framework 3.0 SDK documentation and inspect the server trace logs. 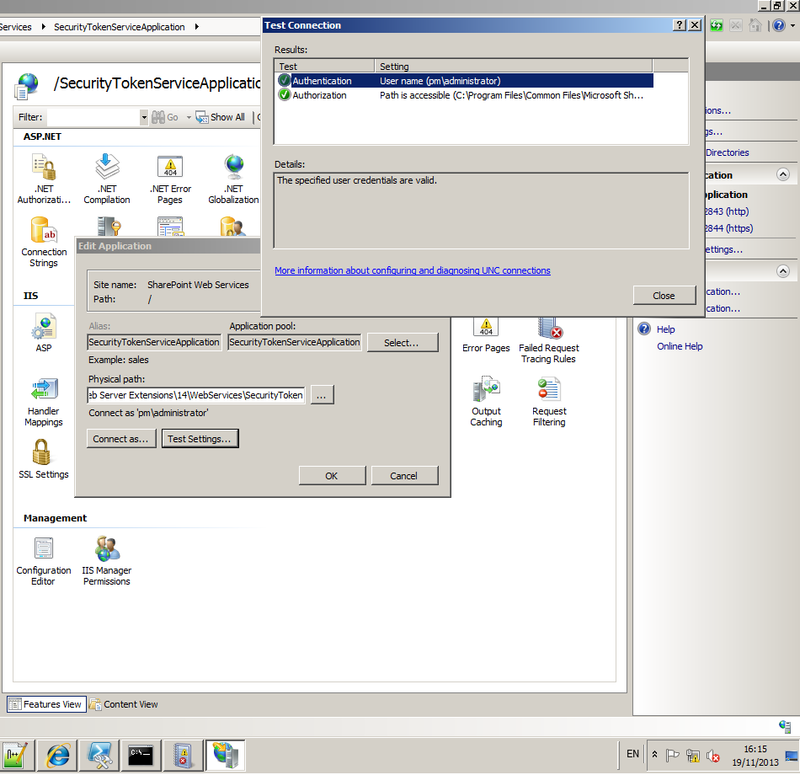 After this I followed the solution posted here: http://blogs.technet.com/b/sykhad-msft/archive/2012/02/25/sharepoint-2010-nailing-the-error-quot-the-security-token-service-is-unavailable-quot.aspx which brought no solution. Please help me on this one. Kind regards. //EDIT: Some additional information, which might be useful. The root-site in IIS is Sharepoint Web Services, which runs under the application pool SharePoint Web Services Root. If I click on Basic settings and then on "Test settings..." I am getting 2 green checks. I have checked, that the managed account that runs the SecurityTokenServiceApplicationPool has valid credentials, is member of the Farm-administrator group and is local administrator. EDIT2: Progress Thanks to Ali Sharepoint's hints I was able to make some progress, which as of yet did not bring the solution. Yet the errors described above (Connection refused) still persist and I am not able browse the service. //Update 22.11.13 I am in the process of comparing the settings of one of our productive environments, one of the dev-machines and the failing dev machine. None of the working environments use a specific account fpr the TokenService. Testing the settings there always results in an error. Also the Claims service is disabled and yet the Service is issing tokens. this could be faulting at several stages! first place to look even tho you migh of already is look at the app pool, start or recyle "sharepoint webservices root". now go under sites and start "SharePoint Web Services" right click, manage and then click start or recycle. if that doesnt work, you could test this one out! right click on SecurityToken and select properties, now goto the security tab. what do you see on the list? do you see the user account that your using within the list? go under advanced settings for securityTokenServiceAppliction and make sure the user account that is used also has access/valid. if all services are running and your still hitting this error than more than likely its todo with the port! make sure its unique and there is no other site using this port number aswell! also make sure that the service for SecurityTokenServiceApplication, make sure '.net trust level' is set to 'full' trust. todo this click on the service, then under 'asp.net' double click on '.net trust level' and within the drop down select 'full' trust ('full' internal). the above is the location of the SecurityTokenServiceApplication web.config that you need to ammend. after reading through the error reported on central admin i could safely assume ;) that its a configuration issue! Have you added any wcf hotfixes??? you would need to. also you need to check on the securityTokenServiceApplicationPool by going to advanced settings! make sure that its targeting framework .net 2.0 and that enable 32 bit application is set to false, you could check against one of your working servers! If the server is running Windows Server 2008 SP2 then ensure that the hotfix at http://support.microsoft.com/kb/971831 is installed. If the server is running Windows Server 2008 R2 then the hotfix at http://support.microsoft.com/kb/976462 is installed. 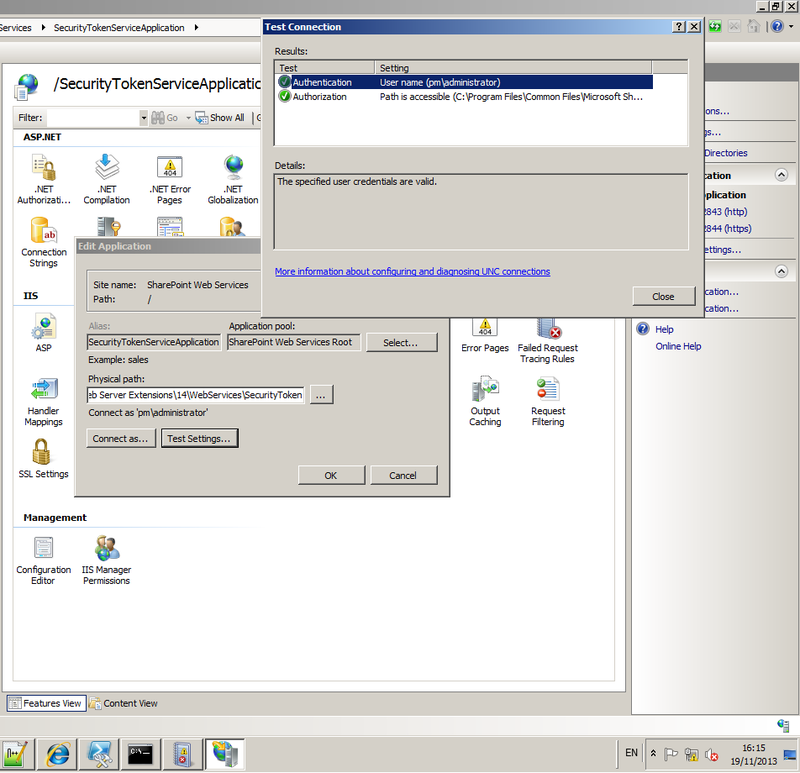 Disable loopback check or specify allowed host names. The two methods are described here. 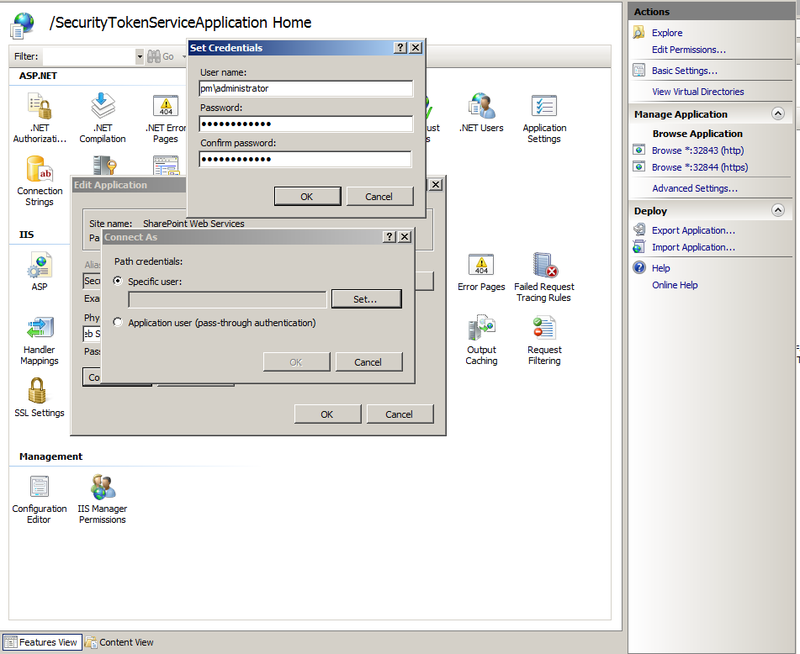 Authentication for the SecureTokenServiceApplication is not configured properly in IIS. 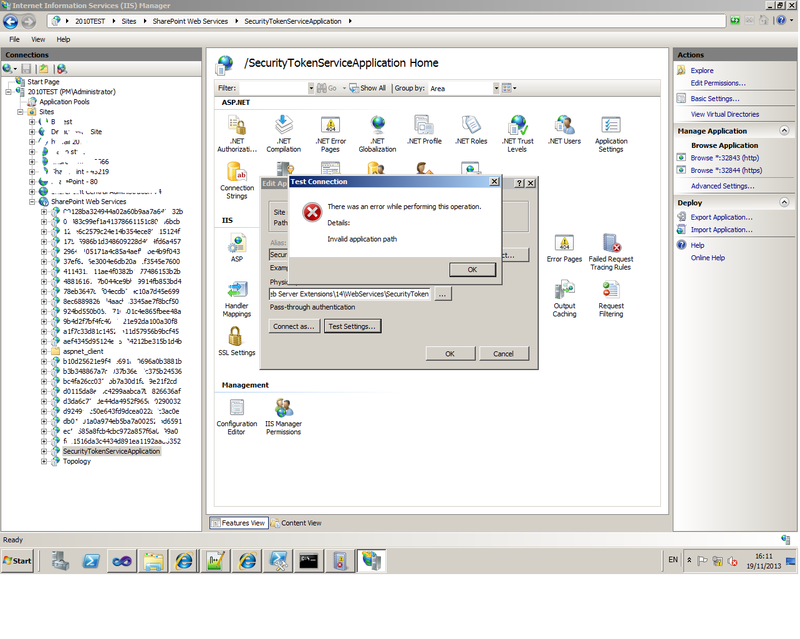 The SecureTokenServiceApplication is not provisioned properly. Missing WCF Hotfix: If the server is running Windows Server 2008 SP2, please ensure that the hotfix mentioned at http://support.microsoft.com/kb/971831 is installed. If the server is running Windows Server 2008 R2, the hotfix mentioned at http://support.microsoft.com/kb/976462 must be installed. Incorrect data in the configuration file: Please review the web.config file of the secure token service application and compare it to a web.config file from a "working" secure token service application. I had the same issue on a server with two IP addresses. I modified the hosts file to point "localhost" to the first IP address (which the STS was bound to), and that solved the problem. I am not a windows systems expert, so I don't know if that is a bad idea for other reasons. I had the same issue it turned out to be a duff username and password for the identity. I recreated the identity and it then worked. for me, the it turned out WWW Publishing Service wasn't started. Not the answer you're looking for? Browse other questions tagged iis sharepoint-server security-token-service or ask your own question.